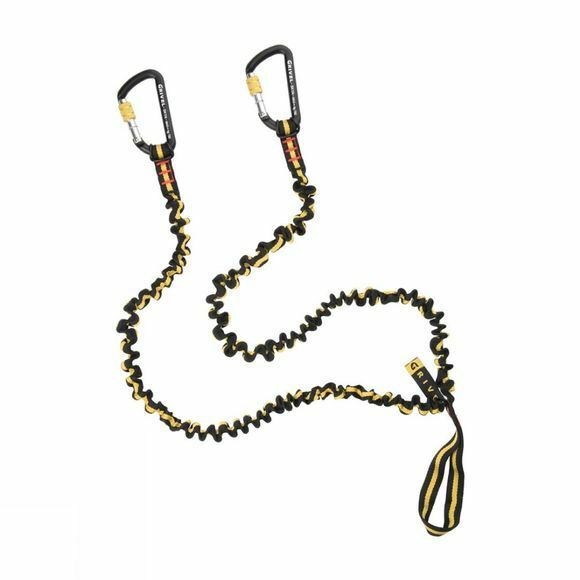 The Grivel Double Spring Leash is light, un-cumbersome and won't interfere with your climbing movement. It is attached to the harness by looping it through the belay loop of the harness. It is then affixed to your tools via 2 small snap-gate carabiners (max 750kg) which loop through the holes on the tools' base spike - allowing easy changeovers of hands and tools. The two lanyard tapes are elastic enough that they don't impede any movement and allow maximum arm extension when required.